I never thought I would say I would sit in the exact same spot as a President at a restaurant. But I did, along with many other celebrities who have visited Red Arrow Diner in Manchester: It is a meal I will definitely remember. As a 24/7 hour joint, this place screams 1950’s retro vibes while also speaking to the nostalgia many of my modern generation have. From the second you walk in you get transported into a fun, quirky vibe where locals and visitors alike are part of the family. Along the walls you will see pictures of the different celebrities who have come to this quintessential diner as well as name plaques on the seats where they had their meals. Personally I love diners, especially ones with history. Red Arrow Diner has been around since 1922 and since has opened up a few more locations in Londonderry, Milford and Concord. You can read all about them on the back of their menu where they talk about how they started along with other tidbits of information. I really loved this place, it made me feel happy and nostalgic. Plus how can you go wrong with a “Cup o’ Bacon”? I went with my husband and friends after a a few hours at a local Manchester lake. We were hungry and ready for a huge meal. Right away I realized I was overwhelmed ( in a good way) about how much was on the menu. From breakfast to dinner they have it covered, although breakfast is served all day 🙂 (Yay for me!) Along with their extensive menu they also have fresh pies, constant coffee brewing, and waitresses always willing to chat with you. Our waitress answered all of our questions and kept us smiling. We ordered a variety of food ranging from breakfast to dinner and of course dessert. I tasted most of everything ( because everyone always lets me 🙂 ) and it was quite delicious. My favorites were the Chicken Fried Steak Eggs Benny (yes you read that right), the cup of bacon, the poutine and the pie. Back to the Chicken Fried Steak Benny- this was AMAZING. I am obsessed with Eggs Benedict and am often quite picky about the Hollaindaise sauce etc…this was just delicious with a like you are at your grandmothers house vibe. The next time you’re in the Manchester area go check out this diner. You won’ regret it. Look at the Meringue piled high on this one!! 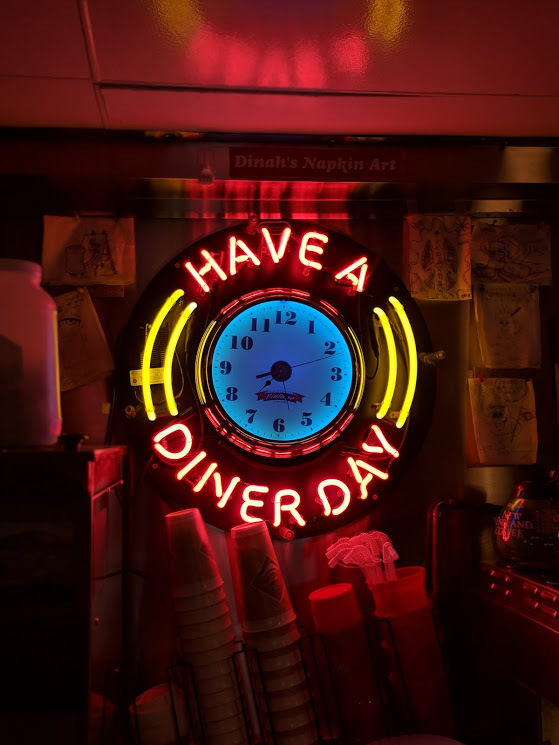 Itching for a diner adventure? Head to Red Arrow Diner, you won’t be disappointed.